Ah! Tempo announced the appointment of Rev. Dr. Leonard Santucci as Chairman of the Board of Directors. A spokesperson said, “Ah! Tempo – Company by Guarantee, announces the appointment of Rev. Dr. Leonard Santucci, D. Min., M.Div., BA., C.E.F.M., J.P., as Chairman of the Board of Directors. “Rev. Dr. Santucci, has spent over 13 years in the field of Education and 27 years in pastoral Ministry. It is his vision to lead Ah! Tempo beyond that of its current roles and into the next phase of serving Bermuda’s gifted and talented youth. “He joins a prestigious group of Directors: Capt. Kenneth Wainwright, Deputy Chairman, Mrs. Evereth Richardson, Secretary, Mrs. Eileen Rodriguez, Treasurer, Mr. Duvon Powell, Creative Director, Ms. Selina Meade, Development Director, Mr. Sean Tucker, Legalities, Mr. Charles O’brien, Marketing Director, Mrs. Malinda Jennings, Programme Director, and Mr. Leon Bascome, Risk Management Director. “As Chairman of the Board, Dr. Santucci will be leading the vision and direction of Ah! Tempo Show Choir Performing Arts Programme, Ah! Tempo Publishers, and QUEST. “Rev. Dr. Santucci once identified  as one of the youngest ‘New Movers and Shakers’ on the island, a gifted and talented administrator, educator and community activist is known for effectively getting the job done. “He brings a wealth of experience to the Ah! Tempo Board. 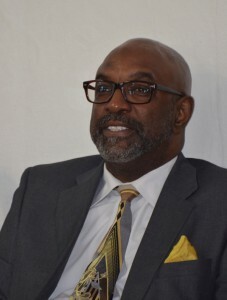 He served as Senator and spokesperson for the United Bermuda Party on many of the largest Government Ministries/Departments whose budget allocations represented one hundred million dollars or more. “Locally and internationally, Dr. Santucci served on several Boards, Ministerial committees and was appointed as the first Non-American trustee of the South Orange/Maplewood Community Coalition on Race. He chaired the Dellwood Board of Governors from 1997-1998. Tucci is a good man!